One of the most sought methods is one-hour whitening. Having completed over a hundred one hour Zoom Whitening procedures, Dr. Behroozan can dramatically whiten your teeth in just about an hour. The ZOOM Advanced Power Plus! Chair side Whitening System is safe, fast and effective. We also offer home bleaching teeth whitening. With this system, you can whiten your teeth at home at your convenience. It can be used independently or as a supplement to the Zoom Advanced Power Plus one hour procedure. There are now two main ways that we offer take home systems. One is with custom fitted trays that are sized exactly to each individuals teeth. These are reusable and offer a long term whitening solution. The other is with pre-loaded whitening trays that adapt to the shape of your teeth. Both are quite convenient and offer prescription strength bleaching power that is up to 10 times stronger than over the counter bleach. Another very effective technique that our patients are buzzing about is our jet whitening technique. Oftentimes, we include this with our cleaning appointments. 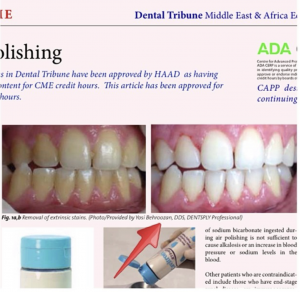 Please see our section: Ultrasonic cleanings with jet whitening. 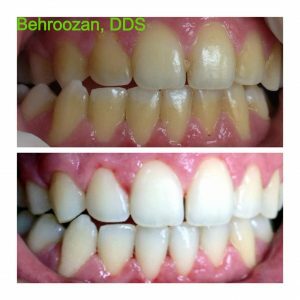 Dr. Behrooozan’s jet whitening photos have been published worldwide and are considered one of the safest whitening techniques available. This exact photo taken by Dr. Behroozan has been published in journals worldwide as an example of his techiniques. Almost anyone. However, treatment may not be as effective for some as it is for others. Dr. Behroozan can determine if you are a viable candidate for this procedure through a thorough oral exam, including a shade assessment. How does the Zoom! In-Office System work? The Zoom! light-activated whitening gel’s active ingredient is Hydrogen Peroxide. As the Hydrogen Peroxide gel is broken down, oxygen enters the enamel and dentin, bleaching colored substances while the structure of the tooth is unchanged. The Zoom! light aids in activating the Hydrogen Peroxide and helps it penetrate the surface of the tooth. A study has shown that use of Zoom! lamp increases the effectiveness of the Zoom! gel by 33% or more, giving an average improvement of eight shades.